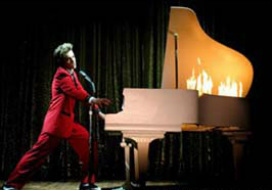 Our Jerry Lee Lewis started his professional music career at the age of 16 years old in Laughlin, NV. He knows how to work the stage with Great Balls of Fire. Watch the video below to hear his stunning emulation, complete with the moves, the look, the sound, and ecstatic fans of Jerry Lee Lewis.